When one door closes, there is alway another, all too ready to slam you in the face. It doesn’t take long to destroy your house of cards life, when there are those around you who are ready to blow an ill and vengeful wind your way. In Sam’s case, his secure, stable and perhaps, even boringly comfortable suburban life is turned on its head in a matter of hours. Within days, his life is twisted beyond belief, and with the passing of only a few short weeks, his life is well on course for complete and utter destruction. Yet, no matter the evil one perceives in others, in the end, it is often one’s own deeds that come back to haunt you. Being no angel, Sam discovers that he can’t walk away from his own mistakes, misadventures and misgivings, although his conscience would prefer to blindly ignore his own failings. His only possible means of escape comes by sheer chance, and an accident, yet he is so blinded by bitterness and hate that he shuns his one true hope of a possible return to reality, and normality. In doing so, he exposes himself to having his life torn to shreds. Through his own selfish and inescapable mistakes, he is to be savagely cut to pieces, by three ill and very vengeful winds, who all wish to render their revenge upon him. 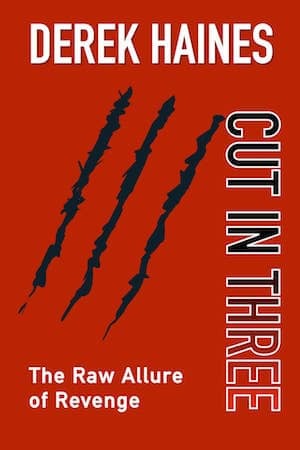 Read Cut In Three – a very noir and bitter account of life in the all too real.